The Simplicity of a 3 Speed. I haven’t posted here until now. Lets hope I’m not way off track, and that I am not covering old ground. 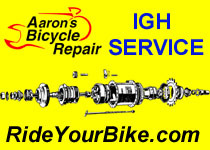 This is a quick one for those of you that have hit a brick wall trying to understand how a 3 speed hub actually works. There are quite a few bits inside an internally geared hub. They can seem a bit daunting. This site gives some insight into what you can expect to find. But what about the fundamentals? A 3 speed hub basically only contains ONE gear. This is one reason why they are so reliable, and such a masterpiece of engineering. One gear is cleverly controlled so that it is possible to switch input and output. In addition to this, a “locked” or 1:1 (input = output) standard freewheel option is included. For arguments sake lets say that the one gear gives a 3 to 4 ratio, (hubs differ). By swapping input and output on the one gear it is possible to achieve either a 3:4 ratio or a 4:3 ratio. When 1:1 is added you have 3 gears. 4:3, 1:1, 3:4. It’s that simple. The internal workings of the hub are designed to control input and output around one gear, and to eliminate that gear to give you a 1:1 ratio. So if you have been looking at the guts of your hub wondering where the 3 gears are, you are on the right track. They aren’t in there.